"Currently just about to leave the Service (Apr 04 2010) and start work for F H Bertling, a freight forwarding company based in Wembley. Remarried with a 20 month son, just trying to get a minutes sleep is enough to keep me gainfully employed." Ray Beastall, Mount Moriah, NF, Canada "Good for you on starting this project. I am curently retraining (at 55 years old) to be a computer support and network specialist." 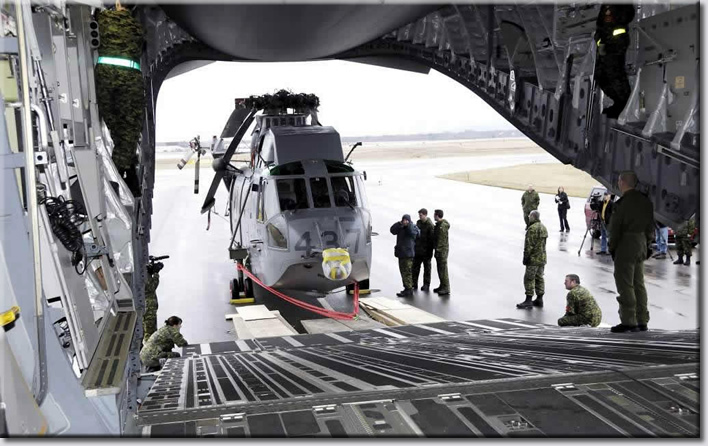 This is the loading of a Sea King Helicopter at 14 Wing Greenwood NS in Nov 09. This is the first of two which were sent to BC for the Olympics. On the left side standing up with the green belt is WO April Roach 2 AMS Trenton and kneeling down by the ramp is Cpl Natalie Dube-Clavette. One of the loadmasters was MWO Ken McCarl, I don't recall all the team members from 2 AMS Trenton but MCpl Olgavie was one of them. I helped load the second helicopter. 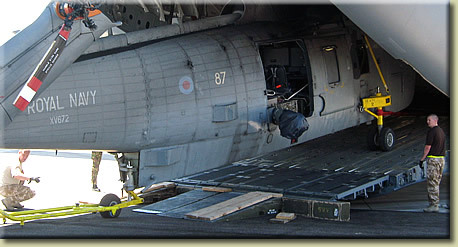 Tony, my guess: Loading of a Sea King at 14 Wing Greenwood in November 2009. 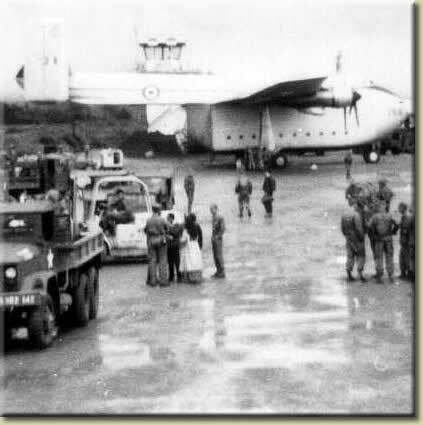 I believe some Cdn MAMS pers from 2 Air Movements Sqn and some Tfc Techs from 14 Wing did the loading along with the crew. 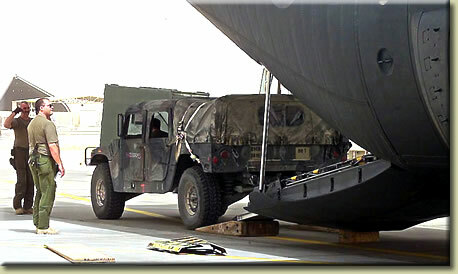 Without stating the obvious CAF mystery photo clearly shows a S61 being loaded on to a C-17 at I assume CFB Shearwater. What I find interesting is the improvised ramp extensions unlike the back breaking ones the RAF use that need 4 people to lift each one. 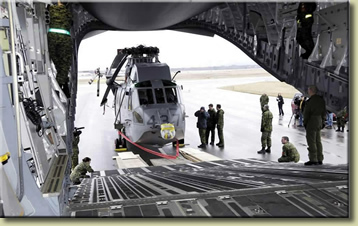 I have attached a similar photo of a Royal Navy Sea King being offloaded at Gunnison, Colorado last year. Thanks for the e-mail and picture. What was interesting about that particular movement was that it was the first of two units being flown out west in support of the 2010 Olympics. There was a subsequent description from the CAF Training WO, Drew Hines, who said, “There is a ramp pedestal shoring (aka 5/4 ton block) with ground loading ramp extensions. Bob Turner’s comprehensive reminder of Op Khana Cascade activated the little grey cells. With the closure of RAF Sharjah and Gulf MAMF in December 1971, I went to HQ38 Group as Admin Plans 1A. A sort of catch-all role coordinating support functions (TSW, Mobile Catering, MT, plods, etc) for Group deployments. Initially at RAF Odiham, in May 1972 the Group HQ moved to RAF Benson. We then further reorganised and the Hercules fleet shunted off to the new 46 Group which began forming in the June and became operational in September 1972. As their sole admin planner, with the title of Tac Ops Logs, I went off to the Group HQ at Upavon, the rump of the old Air Support Command. 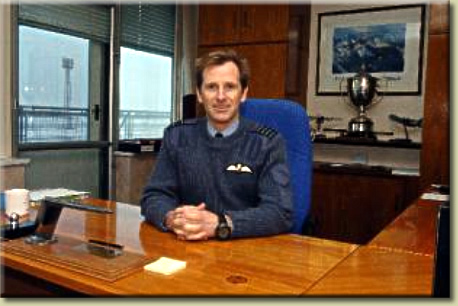 For a couple of months I still had a desk at Benson where I was involved with a couple of Harrier exercises. One Friday in June 1972, I returned to the office at Benson from an exercise recce in Norway to collect my mail, onlyto be met by one of the P staff muttering ‘What are you doing here? - we posted you to Upavon last Tuesday!’ And colleagues wonder why, from then on, I had little sympathy with those who moaned about short notice postings. Anyway – to Khana Cascade, this was the new Group’s first real short notice major operation, as compared with pre-planned exercises. As well as trying to pull together and call forward the many and various support functions. One interesting development was that, by default, I provided a mini-air booking cell for the operation, and I would get bids from the great Air Booking Centre in London begging me for seats on resupply aircraft for journalists, MoD staff etc. Much of Khana Cascade, especially my support area, was planned blind without the benefit of a pre-deployment reconnaissance. 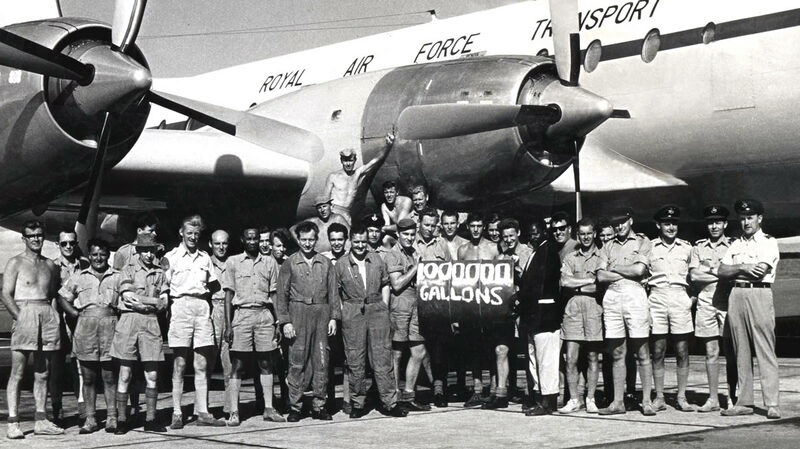 I recall that aviation fuel was a major head-scratcher. Anyway, in the spirit of our current government (and indeed it would appear governments everywhere) apologising for earlier administrative misdeeds, I take this opportunity to now apologise most sincerely to Bob, Gerry Keyworth and the others for my errors and omissions in the provision of support for Operation Khana Cascade. 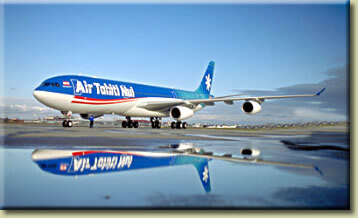 Air Tahiti Nui is contracted for the flights between the UK to Falkland Islands up to and including the 20 Jan 2010 departure from Brize Norton. 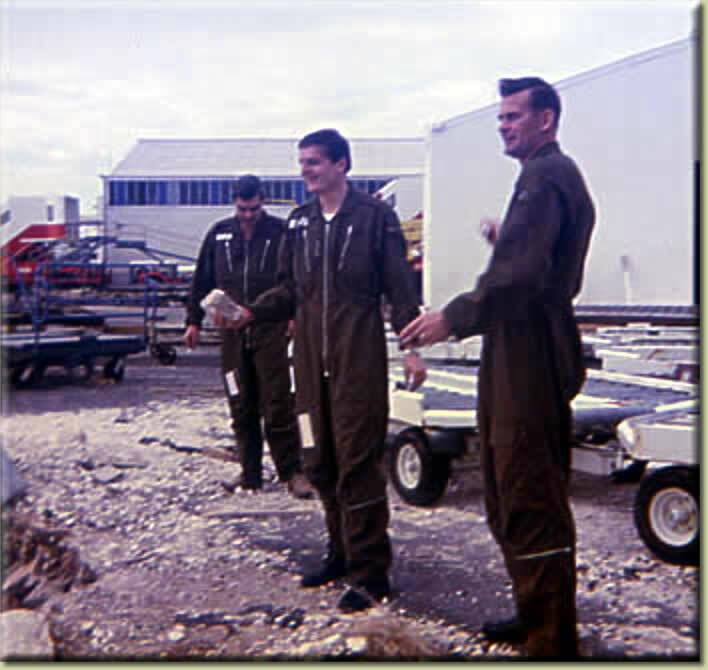 Regarding the Mystery Photo; Don't recognise any of the faces but I reckon it was taken at the old Movers School at RAF Kidbrooke, probably between 1959 and 1961. I recognise the Hastings. Every Course Photo had it in the background. For our younger members Kidbrooke was the Movers School situated in London half an hours Tube ride from Charing Cross. We were trained to be "proper" Movers as we were taught Land, Sea and Air Movements. On the Land movement side we visited Longmoor Camp where the Army trained their Train Drivers. In the late 50's early 60's the Army were back up for British Rail should any serious breakdown occur. We all "had a go" on the footplate of a steam train and were presented with Certificates proclaiming that we were "Engine Drivers Mate 2nd Class".As such we were able to use the initials "NIL ILLIGITUM TRANSPORTUNDUM" or "NIT" for short, when signing our names. Needless to say not many of us did. For the practical element of Sea Movements, my Course acted as embarkation Officers at Southampton. We embarked the Royal Scots and their families aboard Troopship Dunera, bound for Tobruk. In the Berth opposite was the Old Queen Mary, quite a sight to behold. 2 months later I met up with them again as I was posted to El Adem as DAMO. Was invited to watch the ceremonial "Beating the Retreat" at their barracks in Tobruk. Whilst at El Adem I put my Sea Movements training into practice as the El Adem movers used to oversee the unloading of re-supply ships that arrived at Tobruk harbour. (Much the same as the RAF Gan Movers did in later years). Thanks Allan, great days indeed! Kidbrooke, which apart from other things was used for growing tomatoes in. There was of course an extension to School, which I remember was called "The Dover Parole". They used to serve inebriated Airmen. I was on Course No.6 in 1962. This course must have been around that time. adventures. I noticed that he had removed the bone from his nose for the photo. We used to get free tickets to all the great shows in the West End. This was "THE" course to get on, it was fabulous; it was in the days before the Air Movements Courses. Gosh those were the days! This comprised of Clerk (Surface Movements) undergoing the Air Movs course to become Clerk (Movements), and the raw recruits who were here direct from Bridgenorth (square bashin'). I regret that I recall none of the back row and but a few of the middle and front rows. These are, Middle Row: 5th from left, Pat Fagan, 11th from left, myself, 12th from left, Derek Middleton. Front Row: 3rd from left, Harry Peploe, 4th from left, Patrick Smith, 10th from left, Flt Sgt Stone, Cpl Taff Hicks (Admin) and (in beret) Jim Blandford. Chiefy Waltham issued stern warnings to anyone venturing into the flight deck of the Hastings; not that it contained vital nuclear secrets or housed some as yet unheard of aviation system. No, it was simply that it housed his tomato plants! Those brave souls who "volunteered" to represent Kidbooke at soccer, should first have asked themselves where the home pitch was. Too late did we discover that it was on Blackheath Common, about a mile away, and that this meant carrying the posts, cross bars and corner flags along public roads to reach the pitch! Not so funny if we had been trounced 6-1 by RAF Shinfield Park or someone! Kidbrooke did have its advantages though, a short train ride from the nearby station to Central London and the West End was there. I "discovered" Ronnie Scott's Jazz Club there along with a live performance by Dave Brubeck (I'm giving my age away now!). Is anyone able to fill in any of the (many) missing names? A relief aid expert from Gwynedd is helping co-ordinate the massive effort to save thousands left homeless and starving by the devastating earthquake in Haiti. British Red Cross worker David Stevens, 67, of Bangor, has been called in for his air expertise to plan how thousands of tonnes of aid can reach those in need in the crisis-hit nation. He says that any methods will be considered to get aid into a country where the airport is struggling under the scale of the humanitarian operation. 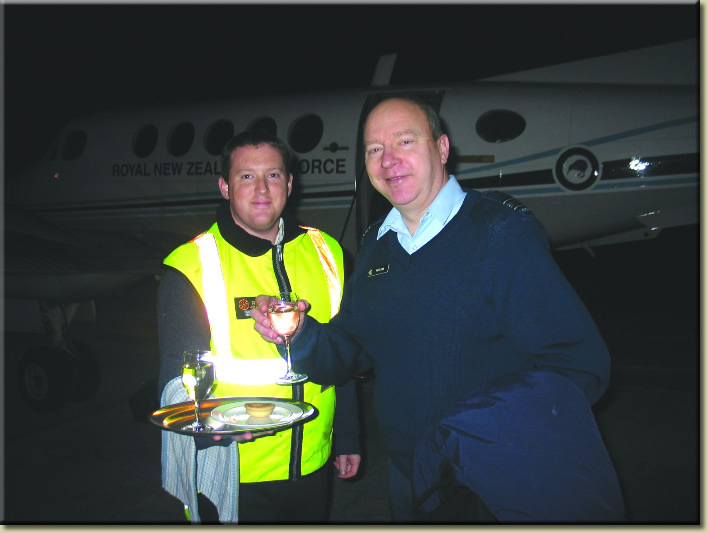 Former RAF officer David, who helped provide aid after the Bam Earthquake in Iran in 2003 and the Tsunami in 2004, is coordinating supplies from neighbouring Dominican Republic before heading to Haiti. He expects to be in the region for up to six weeks and said: “Our plan will be to get the aid into Haiti. The airport is operating again, but under a lot of pressure. We may look to alternative ways of getting it in there like by sea and air, perhaps using helicopters. Our job will be to identify the stocks we have and how we can best move them." The Haitian Red Cross has pre-positioned relief supplies for 3,000 families in Haiti, with supplies for thousands more in the nearby regional warehouse in Panama. These emergency supplies consist of kitchen kits, personal hygiene kits, blankets, tarpaulins and containers for storing drinking water. 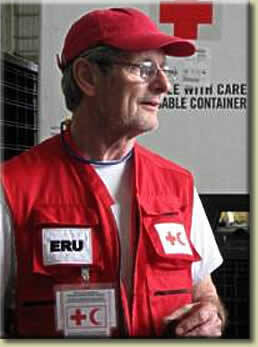 Before joining the Red Cross, David spent 23 years in the RAF and 16 years with British Aerospace. David retired in 2000. The British International Rescue Dog team, based in Llanfairfechan, had hoped to be part of the rescue effort. But despite huge efforts to reach the crisis-hit island they were unable to get to the disaster scene. David Powell makes the statement that John Lambert wrote the cost cutting paper that triggered the relocation in 1974 of UKMAMS from Abingdon to Lyneham. Well, that's not what I heard at the time as I was Ops Officer with Bryan Morgan OC UKMAMS. I distinctly remember Bryan calling me into his office to say that SAMO Lyneham (the incumbent Wg Cdr's name escapes me) had written a cost cutting paper that had been accepted at MoD and that the move to Lyneham was confirmed. John Lambert at the time was Sqn Ldr OC Supply Leuchars and was then selected on promotion to be the first Wg Cdr OC UKMAMS. We moved over lock stock and barrel without Bryan to meet John in post at Lyneham. The C-17 Globemaster looks like an airplane, but it is so enormous -- 300 metric tons fully loaded -- that it seems incredible that its wings can actually lift it off the ground. I boarded one of the monsters on a Canadian military base in Southwest Asia last month on my way home following a tour of Kandahar Airfield in Afghanistan. It's the same rapid transport jet that some critics dismissed as a vanity project when the military made a request for the massive bird about 10 years ago, but world events have vindicated the decision to purchase four C-17s for $1.5 billion. Two of them are lending their weight for the relief effort in Haiti. From the ground to the tip of its vertical tail wing, the C-17 is nearly as tall as a six-storey building and just as wide, wing tip to wing tip.The cargo compartment resembles an industrial warehouse, with its winches, gears, pulleys and gadgets for loading, storing and securing a variety of payloads, including helicopters and even tanks that weigh several tonnes. It's not pretty and it's not built for comfort, but it is a model of aeronautic engineering and efficiency. The imposing freighter is handled by a crew of just three -- two pilots in a cockpit located above the cargo bay and a loadmaster who monitors the cargo and other systems. Buckled into fold-down seats along the bulkhead, backs against the wall, it was impossible to maintain vertical posture as the pilot throttled forward. With 40,500 pounds of thrust in each of its four engines, the warehouse-on-wings accelerates with an ear-splitting roar (even with earplugs) and at a rate of speed that seems improbable, considering the scale and magnitude of the vehicle. The C-17's cruising speed is 833 km/h, or nearly the speed of sound. There wasn't much cargo on this journey, so the loadmaster invited our small group of journalists and soldiers to feel free to stretch out on the cold steel floor once we were airborne. We were advised, however, to avoid the rear of the aircraft, in case the cargo door should open for whatever reason. "You'll be sucked right out," he warned. The compartment can get so cold that ice sometimes appears in the rear, but most of us managed to curl up on the floor with a blanket and get some rest. There's no point trying to talk to anyone, since we were all rendered deaf before liftoff. The landing at CFB Trenton was as smooth as a baby's bottom, but one of the surprising capabilities of the C-17 is its ability to land on short runways, including rough and uneven ground. Until the first copy was delivered from American manufacturer Boeing in 2007, Canada had limited airlift capability, which often prevented us from acting independently on the world stage, even when our self-interest and international reputation was at stake. 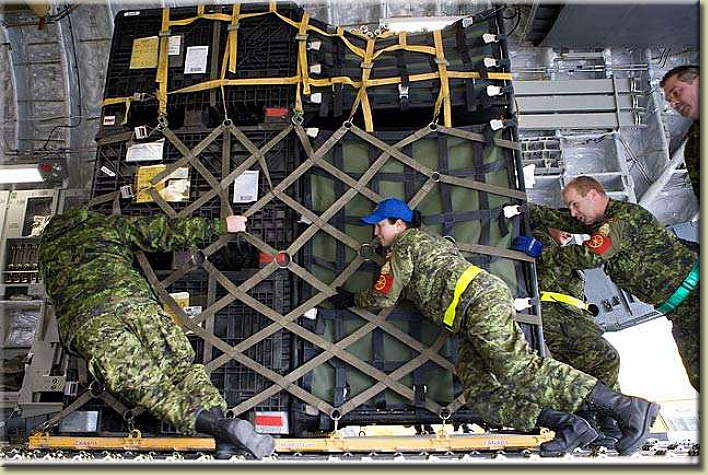 For example, when Ottawa wanted to deploy its Disaster Assistance Response Team (DART) to Sri Lanka following the tsunami in 2004, it had to wait several weeks before it could lease strategic airlift from the Russians. A similar delay occurred during a deployment to Haiti in 2003. The air force also had to rent Russian airplanes to move heavy equipment into Afghanistan. The crisis in Haiti today shows once again why Canada needs the capability to project power around the world without being forced to rely on handouts or rentals. We will always depend on others for help -- just as they will call on us -- but a sovereign nation with global interests must have the capacity to act independently and quickly on some issues. Canadians have long-standing ties with Haiti -- a relationship deepened by Gov. Gen. Michaëlle Jean's special connection to the land of her birth -- and it would be humiliating if we were unable to respond to the crisis because we lacked the means. It's about meeting our responsibilities as a wealthy people with friends, allies and obligations around the world. Canada is sending ships to Haiti, but the navy does not possess adequate sealift capacity and it has been forced in the past to lease heavy transport ships for operations in the Balkans, East Timor and even Afghanistan. At various times over the years, some Canadians have wondered why we own tanks, fighter jets, frigates, submarines, helicopters, and guns and bombs. Frankly, I wondered if we needed it all, too, particularly after the fall of the Berlin Wall when there didn't seem to be a threat in the immediate future that would require the tools and toys made by Boeing, General Dynamics and Lockheed Martin. But recent events would seem to show that I and others like me were wrong. Even if you oppose the war in Afghanistan, the fact is many young Canadians have been saved by the weapon systems that once seemed so unnecessary. For example, Canada nearly trashed all its Leopard tanks a few years ago because it was believed they would never be needed, but there are many infantrymen who owe their limbs and lives to the fact the decision was never carried out. The same is true of the Chinook helicopters, a platform that Canada abandoned in the 1990s, only to have to reacquire it to improve safety and security for the troops. And as we are seeing in Haiti, many of the tools of war can also serve in ways that save lives and restore order, both abroad and at home. Seems like the Boy Scouts had it right all along. Be prepared. From: David Cromb, Brisbane, Qld. 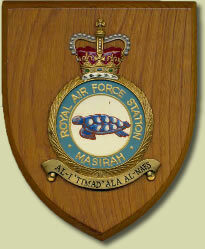 Subject: DC's RAF Masirah website. Thanks for yet another splendid edition of the brief for 12/09, well done. Might I impose please mate. I have neglected my subject website for quite some time for a multitude of reasons. I have resurrected the beast and ask if you would spread the word on my behalf please. Call me "gravelknees" amongst other pleasantries if you choose, as long as it gets results I don't care. My thanks in anticipation to not only your goodself but prospective contributors alike. Keep up the good work mate, it's appreciated by this little black duck anyway. Lima 6 'n' bloomin' proud of it! Here you go DC - the baggage tag is compliments of Malcolm Porter and the shield... well, in typical MAMS tradition I lifted it! I received a telephone call from Dave Moss in Clitheroe, UK, apologising that his computer had regretably suffered a malfunction of great proportion and was down for the immediate future. He wanted to pass on the message that he had received from Joan and Family thanking all those members of the OBA who had sent messages of condolence when Dave Wright passed away last December 20th. Another brilliant edition of the newsletter; thank you most sincerely. Never had the pleasure of knowing or working with our three departed colleagues, but nevertheless I “dips me lid” (Aussie for ‘raise my hat’) to three more Movers gone to the big crewroom in the sky. If St. Peter ever does decide to ride out with his fiery chariots (Book of Revelations), he’ll have a great movements team to help him load up! Working with MATU 2 from RAAF Laverton, at Bourke, NSW, on Ex Droughtmaster mid-October 1980. Some bright spark graded off the surface of the aircraft parking area and we were ankle deep in talc-like bull-dust by day four of the deployment. Were dry bogging Army 6 x 6 International trucks just trying to get them out to the incoming Hercs to pick up the gear. 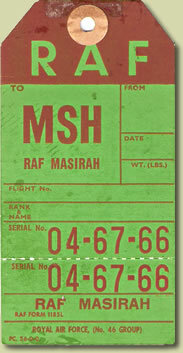 26 August 1967. FEAF MAMS. 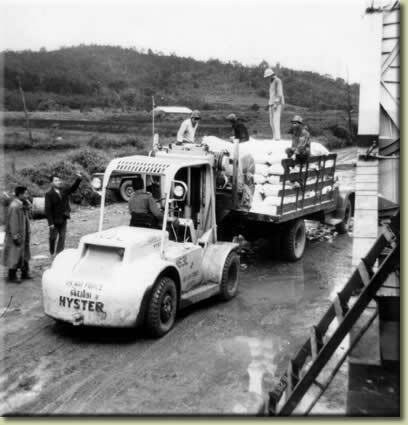 Delivering OXFAM and Catholic Relief Service supplies to Dalat, South Vietnam. Beverley XB264. Many thanks Len - those Dalat photographs are very good for having been taken on a disposable camera! Congrats on your extension! With widespread outrage and appeals to the Government to reconsider the closing of RAF Lyneham, the people who work there are suprisingly supportive of the move. The decision to shut the base in 2012 and transfer to RAF Brize Norton has been widely criticised by politicians and local people, but the personnel who work and live on the base say it’s the only way forward. The station currently employs 2,437 people, including personnel, civilian workers and contractors and there will be some casualties when the move happens. The present scheme will see 251 service personnel being redeployed elsewhere, 481 contractors will no longer be needed along with 125 civilian admin posts. Since the decision was made to close the base in 2003 a team, known as Future Brize, has been in charge of the logistics of the move and the preparation in terms of personnel. Heading the team is Squadron Leader Lynn Powell who say s everything is running on time and with no major problems. She said the base’s two flight simulators, the most crucial piece of training equipment the base has, will be moved in April next year with all of the personnel moving between August and December 2012. The gates at RAF Lyneham are due to officially close for the last time on December 31, 2012 when the final pieces of equipment and people are moved to Oxford. Although the base will be shut, work will continue in terms of securing a future for the site. It has not y et been established if the base will be handed back to the former landowners or used for something else. The only thing that is certain is that, due to the use of aeroplanes and machines on the plot of land over the past 40 years, an environmental impact survey has to be completed along with any treatment work which may be needed. "It will be a catastrophe." That is how the people who live and work in Lyneham view the closure of the air base. Many in the village are still largely against the move to RAF Brize Norton in Oxfordshire and say the closure of the base will damage everything from the economy to the local school. No one has tackled the decision to close the base more than North Wiltshire MP James Gray, who took the campaign all the way to Westminster earlier this month. During the debate Mr Gray presented a weighty dossier which outlines a number of reasons why it would be a disaster for RAF Lyneham to be closed. He said that it would be wrong to put all of the country’s transport aircraft on one site at Brize Norton in Oxfordshire and demanded answers on why the risk had not been fully assessed. The RNZAF mystery photo in your last newsletter is of the “Lima One’s” who were part of the UNSCOM [United Nations Special Commission] mission to Baghdad from 94 to about 99, looking for the weapons of mass destruction. Back row L – R is W/O Noel “Budgie” Baigent, W/O Rtd Gary “Gumby” Portas, F/Sgt Tony Lucas, Sgt Rtd Jon “Head” Felton, Front row L – R F/Sgt Jeremy Walshe, W/O Brian “Bubba” Lay, F/Sgt Rtd Ian “Felix” Alexander. 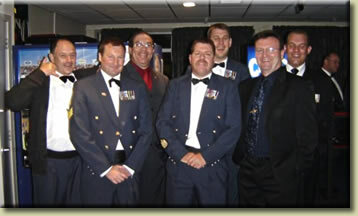 The photo was taken at a Dining-In at Whenuapai W/O’s & SNCO’s Mess at RNZAF Base Auckland. The Lima One’s did a 6 month TOD looking after the movement needs for UNSCOM. A very enjoyable tour. If I'm not mistaken this pic was taken at the Dining Out for W/O Monty Campbell (ex Air Mover) in May 2005. 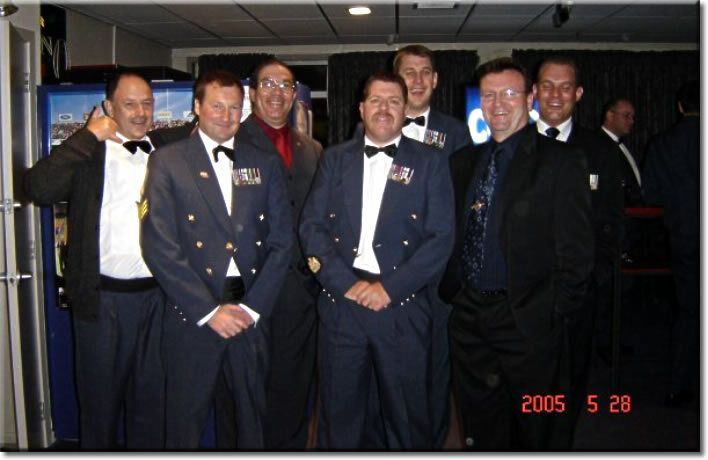 The guys in the photo are all ex UNSCOM MOVCON's [Callsign "Lima One"] who worked in Iraq during the late 1990's. The handsome guy on the left is W/O 'Budgie' Baigent and the others from left to right F/S Jeremy Walsh, W/O 'Gumby' Portas, W/O Brian 'Bubby' Lay, F/S Tony Lucas, F/S 'Felix' Alexander & F/S Jon 'Head' Felton. Gumby beat you to it Budgie! From: James Aitken, Brisbane, Qld. This brought back memories of 1950s days at Lyneham. The J4 hangar (freight shed) doors were manually operated.....no such luxury as automatic push button activation. The on duty "loading party" would hear the call......"on the hangar doors" and once enough brawn was present the call would go out.... TWOOOOO .. SIX. Slowly, the enormous door would slide open on it's track. I had always assumed that this cry was RAF inspired. 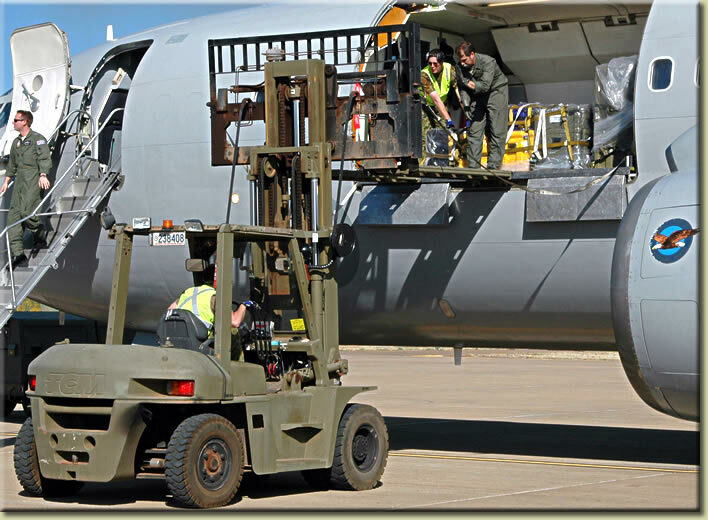 It was also used regularly when loading aircraft. That was in the days when the only mechanical assistance was a pinch bar and sheer brawn ! Googling, to feed my curiosity, I was able to discover that we pinched the ''cry" from the Royal Navy and not the modern outfit, but the from the days of Nelson and cannon!! "Two, six, heave" is a phrase used to coordinate seamen's pulling. It derives from the orders used in firing shipboard cannons in the British Royal Navy. The team of six men had numbered roles. After loading, it was the task of the men numbered two and six to heave (in a coordinated fashion) the cannon out the gunport for firing, using simple effort for a light cannon or a tackle apiece for larger ones. Shanties not being countenanced in the Royal Navy, "two, six, heave" was pressed into service whenever seamen needed to pull in a coordinated fashion, such as braces and halyards. In Britain it has a deeper penetration and is often used in any situation where a coordinated pulling (or pushing) effort is required, often where maritime people are involved, but almost as frequently where 'civilians' are working together. As used by sailors, the person at the front of the team will typically call out the "two, six" part of the chant. During this phase all members move their hands up the line ready to pull. This is followed, in its natural rhythm, by the "heave", called out by the whole team together. At this moment, the team simultaneously lean back on the line, and use their leg muscles to exert a powerful pull upon it. This coordination takes some practice to achieve, but the difference in applied power between a raw group pulling as individuals and a practiced team hauling together is very significant. So there ya go... the Senior Service takes the credit. January 20, 2010: The first American C-130J for the Canadian Air Force has been built and will be delivered shortly. Canada is buying 17 C-130Js to replace its older C-130Es. Canada has been using the C-130 since 1960. The most common version is the C-130H. It has a range of 8,368 kilometers, a top speed of 601 kilometers per hour, and can carry up to 18 tons of cargo, 92 troops, or 64 paratroopers. The latest version, the C-130J, has a top speed of 644 kilometers, 40 percent more range than the C130H, and can carry 20 tons of cargo. 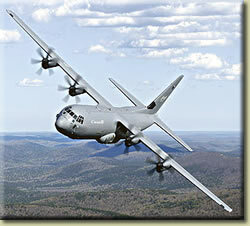 The C-130 has been in service for over half a century, and is used by more than 50 countries. Canada has also bought four C-17s for supporting international operations. The 290 ton C-17 can carry up to 100 tons (including one M-1 tank) anywhere in the world because of in-air refueling. The C-17, costs about $250 million each. Britain is the largest foreign user of the C-17. Australia and Canada each of four. The U.S. Air Force operates 173. Happy New Year to you, your family and all members of the Movements Mafia. For info, I had an overnight stay in hospital on 5 January and had a lumbar discectomy. I've had issues with some numbness etc., down the left leg which the neurosurgeon said was caused by a bulging disc. So, she has done an operation and theoretically the problem will be resolved in time. But for the last two weeks I have been walking like the Hunchback of Notre Dame. Anyway, if I can't take a joke what am I doing here. If it's any comfort at all Vic, you are not alone! Seychelles President James Michel has welcomed the announcement by Air Seychelles that it has begun operations to the Falkland Islands as part of a contract with the UK Ministry of Defense. In a statement, President Michel noted that “The fact that Air Seychelles has won the contract for these services is a mark of the high standing of our national airline and the professionalism and dedication of its staff”. He also noted that in the increasingly competitive international airline market, it is encouraging that Air Seychelles is also seeking to adopt innovative business practices beyond its core business: “Innovation is key to Seychelles being ready for the future, and we congratulate Air Seychelles for taking the lead in this way”. Air Seychelles successfully bid for the contract after the UK Ministry of Defense had to seek a replacement for the previous operator who had to stop flying due to bankruptcy. Several other prestigious airlines bid for the contract, but Air Seychelles was successful due to its experience with Boeing 767s and flying to island locations. The length of the contract will be finalized in due course, but it is expected that the agreement will significantly improve revenue flows and therefore the airlines perspectives for 2010. 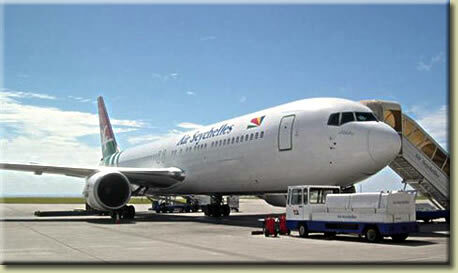 A press release from Air Seychelles said that one of the company’s B767-300ER on Sunday 24 January 2010 commenced the South Atlantic Airbridge on behalf of the UK Ministry of Defense from RAF Brize Norton in Oxfordshire, England to Ascension Islands and then onto the Falkland Islands. Both Ascension Islands (Wide Awake Airfield) and RAF Mount Pleasant in the Falklands are isolated airfields. Given that Mahe is also considered an isolated airfield with no nearby suitable alternate aerodromes the operational experience of Seychelles flag carrier has played heavily in the airlines favor in the selection process. 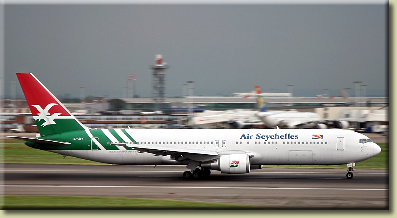 Likewise being one of the world’s most experienced B767 operators with over 20 years extended range operations and having a meaningful fleet of aircraft, Air Seychelles was considered the best choice. To enable this operation to be effectively conducted one of the airline’s five B767’s, a B767-300ER will be permanently based in the UK to carry out the twice weekly service to Ascension and onwards to the Falklands. Crews have been positioned in Ascension and the UK. I recognise John O'Regan and another couple of people in the photo namely Tony Singleton and a couple of others whose names I cannot remember.I also think the photo was taken at Nairobi as the majority of people on the photo were "reforce" from other movements units. I arrived on MAMS which was then in the movements hanger at Abingdon and there were 3 teams, the officers being Pat Shrimpton, Dave Stevens and Gordon Spiers with some of the others including John Guering, Graham Gibson, Taff Yeoman, Johnny Hudson and George Redman and of course John O'Regan. I also remember Derek Clayton, Pete Underwood, Baz Hughes from around that time and although we had designated teams it was not often that we worked together. We sometimes worked as individuals which happened when I first met Gordon Spiers replacement Bill Jacobs as I got recalled from an exercise in Wildenrath to go on my own with 2 Argosies to do a recovery in Norway. That task stands out for me as the captain on the second aircraft realised I was totally knackered and got HM Customs, who covered both Benson and Abingdon, to let us touch down at Abingdon first to drop me off before going on to Benson. That is the first time I have seen that photo as I spent the majority of my time at the other end of the lift except for the time in Dar Es Salaam with people like Stan Brown, Charlie Weatherspoon and Bill Martin who were all grabbed from station movements at Abingdon. I believe that's the unmistakable Sandy Sandiford in there too Chas! 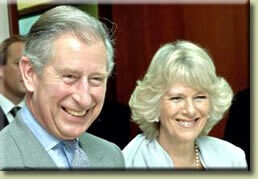 Prince Charles and Camilla will visit Wootton Bassett on Friday to thank the town for its support for repatriations. A spokesman for Prince Charles' office at Clarence House said: "Their Royal Highnesses The Prince of Wales and The Duchess of Cornwall wanted to thank the people of Wootton Bassett for their unstinting support of the Armed Forces over the past two years. "In particular TRH want to meet some of those who regularly take part in the town’s spontaneous repatriation ceremonies." Each time a soldier killed in Afghanistan is flown back to RAF Lyneham hundreds of Royal British Legion veterans, shopkeepers and residents line the streets of the town to pay their respects as the coffins are taken to The John Radcliff Hospital in Oxford. Last month, Prince William presented town mayor Steve Bucknell and RBL’s Anne Bevis with a special recognition award at The Sun's Millie Awards. The visit, on Friday afternoon, will include a short ceremony at the War Memorial, a visit to the Cross Keys pub which has regularly looked after bereaved families on repatriation days and a reception. From a complete stop, a human is capable of outrunning a Formula One Racecar for about 30 feet! The UK Ministry of Defence has clarified its position with regard to the restrictions imposed on some passenger operations with the Royal Air Force's Vickers VC10s, and says the type "remains safe to fly". "Passengers are still being flown on VC10s on defence business, including pre-deployment exercises, such as to Kenya," the MoD says. Updating an earlier statement in which it had said that all passenger-carrying activities with the almost 50-year-old type had been halted because of an ongoing airworthiness review, it now says: "We have temporarily stopped using VC10s for a small number of flights while we review the basis on which passengers fly on the aircraft in roles equivalent to commercial flights." It adds: "The VC10 remains safe to fly, and continues to do so in support of operations over Afghanistan, with air-to-air refuelling of RAF [Panavia] Tornado GR4s and other coalition aircraft on request." In Holland, you can be fined for not using a shopping basket at a grocery store!